Finding the right thing to post is hard, especially since there is no “right” thing. Funny right? Today was especially hard, I started like three other posts and eventually decided this was the one to share. The quote was found on a cup sleeve from Starbucks and it touched my so I kept it. I have it posted right next to where I am writing right now. It may be simple but to do it it does take courage. You need to those negative thoughts where they belong (in the trash aka. Banish those baddies). Take the comments from others with a grain of salt ,especially when they are along the line of you old negative thoughts (if they are then again, put. them. in. the. trash.). Then there are just life roadblocks. It makes us want to scream! but, if you are doing what you want then you will still be happy and that is what counts. Don’t sweat the small stuff and live how you want to live! or take steps to create it. My small steps have been working here at Tea Journey, getting my portfolio website up and going, working with a designer to get them all sparkly and new and working on my Entrepreneurship class. The last is the hardest. But working towards doing something I LOVE full time is my dream. 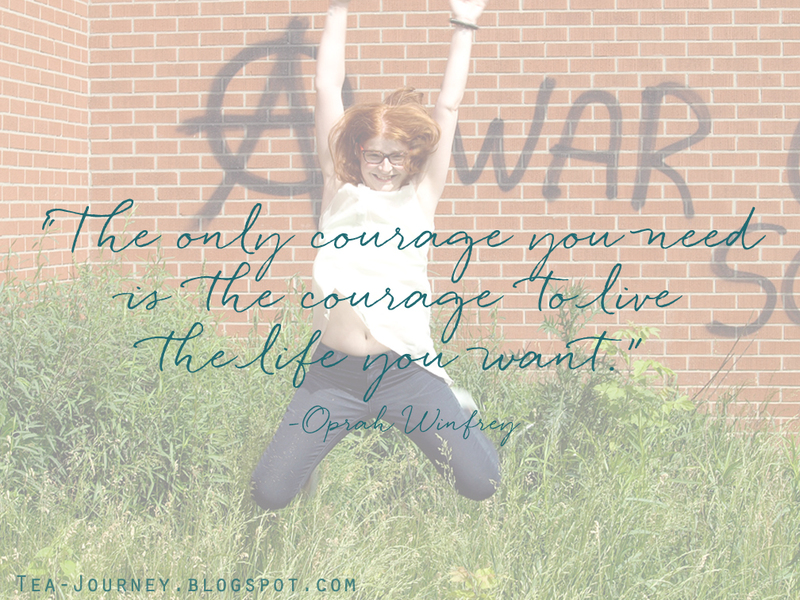 What scary thing are you working on or towards that you are building up the courage to do?